The Air Canada Express regional service, to be operated by Chorus Aviation subsidiary Jazz with 74-seat Bombardier Q400 NextGen turboprop regional airliners, will offer four round-trips a week from May 22 through September 7, 2015. Under the Air Canada Express brand, Air Georgian will operate the three daily round-trips between Red Deer Regional Airport and Calgary International Airport using 18-seat Beech 1900D turboprops. With the departures on February 1 of Air Canada Express flights AC8371 from Calgary to Fort McMurray, AC8430 from Calgary to Regina and AC8586 from Calgary to Saskatoon, Air Canada has introduced Bombardier Q400 NextGen service in Western Canada. The transaction involves the conversion to firm orders of six of the 15 options taken by Jazz Air when it placed its original order for 15 Q400 NextGens, announced on April 30, 2010. Jazz will operate the aircraft under the Air Canada Express banner. 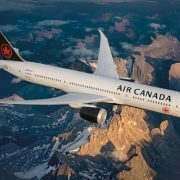 Air Canada has inaugurated service between Toronto Pearson International Airport and John F. Kennedy International Airport, making the airline the only carrier serving all three major airports in the New York City region from Canada.